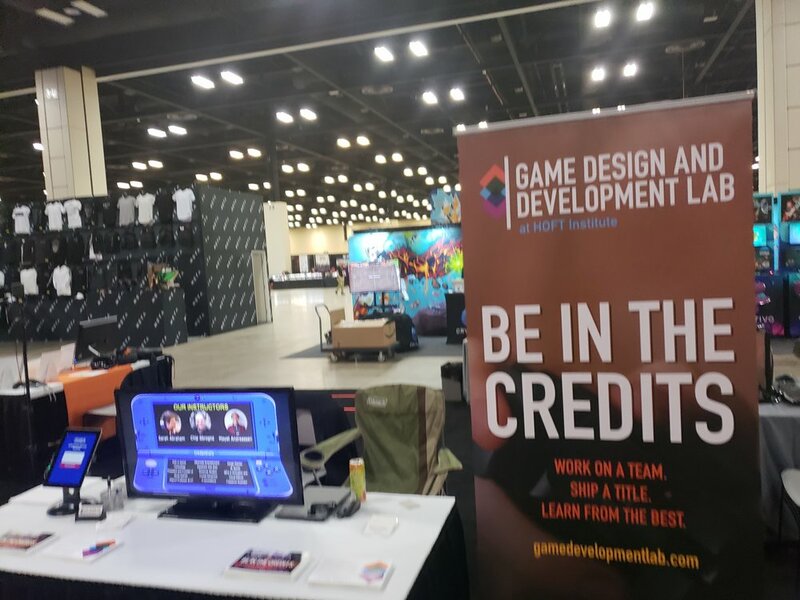 HOFT Game Lab had a presence at San Antonio’s PAX South event last weekend, thanks in no small part to Tim and Alex Porter of Underminer Studios, one of our employment partners. We had a great time, though some of us might still have sore feet from standing and walking around the vastness of the Gonzalez Convention Center, and raspy throats from speaking to hundreds of people. Besides our booth, some HOFT students and staff were seen working at game developer and publisher booths throughout the expo floor. Thanks to Fantasy Flight, No More Robots and Ysbryd Games for putting us to work! Thanks also to Rich Weil and the panelists for the annual “Breaking In” panel, which was actually two different hour-long panels, back to back. Because of this opportunity, we were able to pass out business cards and chat with people who came to PAX and were curious about their options as professional game developers. It’s worth noting that San Antonio has a game development sector four years in the making, with its Greater Gaming Society and its recently reorganized IGDA chapter. San Antonio doesn’t have the history of game development that Austin has, and those involved there will admit that it took the advent of the first PAX South in 2015 for those interested to come together and get organized. The first effort was a PAX South panel, and everything has come from that, including shipped titles, a better cooperation for local schools and students, and their own Global Game Jam location this coming weekend. Let’s keep in touch, everyone. The road between Austin and San Antonio is a few hours long. It shouldn’t be a world away.